Measures 24 inches diagonally across and 5-6 inches deep. our Pumpkin wreath is good choice for Halloween or thanksgiving,it will add great festive atmosphere Wreath is packaged well in box note The wreath not suit to cottage front door Packing List wreath---1pc Tips: 1.When you display the artificial Flower for a long time,there may be some dust on it,you can use hairdryer's cold air clean it. 2.If there is too much dust or the artificial flower is polluted badly,you can also clean it by wet dishcloth.Or you can dig them in brine 2 hours,then use clean water wash it.Don't Scrub it,or the flower head will be broken. 3.Avoid sunlight exposure.make it upside down,dry it by soft wind 4.It may be Squeezed in the transit,Slightly arrange flowers,it will show as you excepted. 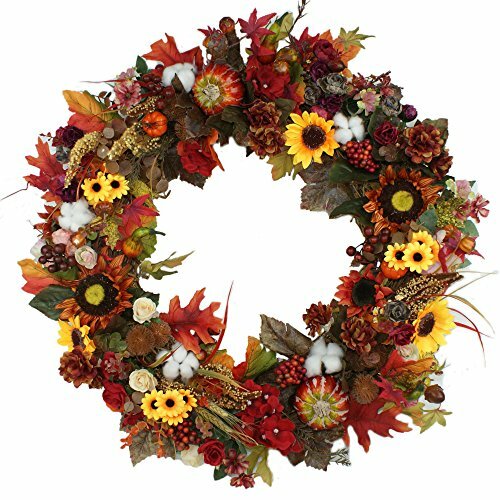 Extremely full wreath design that weaves the elements of fall together beautifully. If you have any questions about this product by Forevercute, contact us by completing and submitting the form below. If you are looking for a specif part number, please include it with your message.